Welcome to Fully Functional, focusing on getting the most out of you MTGO avatars! This past week there was another influx of Jhoira avatars with the distribution for the release league participation. This means that a whole new group of people are trying out the format this week, myself included. I don't think I'm the only one who skipped the release premiere events and played in the release leagues and therefore needing to wait for their avatar. Since the Jhoira is essentially free, I imagine that people are willing to throw 60 lands into a deck with it and try it out with the Jhoira Basic format. I did, and changed my initial tune a bit I must admit. probably 'cause you look like Kirsten Dunst with a ponytail. and by him I would crank out a threat or response each turn with no fear. until a wish for Azorius Guildmage, a green epic, or someone decks. but there's still nothing like slamming down a free Crush of Wurms. but I'll always be with you Jhoira, if I got more than an hour. Earlier I had Glittering Wished for Firemane Angel, discarded it sometime after that, and was gaining life from it sitting in my graveyard. My opponent casts Roar of the Wurm and has a 6/6 threat. I then pull Living End to kill his wurm and bring my angel into play. His next turn brings Death Mutation to kill the angel and give himself 6 1/1 tokens. My next turn pulls Decree of Pain to kills those guys and draw 6 cards. I ended up winning that game with 30+ life and <10 cards in the library (I got Traumatized at one point too). - Most games have a nice feel of excited activity tempered with lulls in the action (both players with no cards in hand, casting 1 spell per turn hoping to hit something interesting). - You'll most likely be playing sorceries every turn unless you need to protect a threat on your side, or get rid of one on your opponent's side. To make the instant attempted creature kill as relevant as possible, cast it while your opponent's spell in on the stack. Even if you don't get the creature kill, you might pull a counterspell and your attempt wasn't totally worthless. - If you and your opponent have creatures and he has an advantage, attack first and then cast the sorcery, which, more than instants, have board sweeping spells and you might wish you'd have attacked before Wrath of God. If you're the only one with creatures, cast the spell before attacking since, you're not going to use a board sweeper anyway and you might pull a Overrun. - The "triple option" (or quadruple if you consider not casting a spell an option) makes for excellent gameplay decisions, do you: A. draw cards, B. kill an opposing land, or C. have your opponent discard? Or for the earlier instant example, do you A. kill the creature or B. counter the spell? - You probably don't need to have more than 6 lands in play actively. This will give you two spells per round, be it 2 sorceries or a sorcery and a later instant. 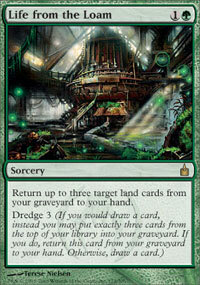 6 lands basically (heh) means that you're discarding more cards than you regularly draw. Games can come to a screeching halt if someone doesn't know how to wish, or what to wish for. Therefore I'd like to present you with a little wishlist cheatsheet for your Jhoira Basic needs. There are 5 Judgement cycle wishes, and Futuresight's Glittering Wish for a total of 5 "outside the game" sorceries. If you're playing with instants, there's Cunning Wish and (Research). To wish for a card, wait until the spell resolves and the client prompts you to select a card from your collection. Go to your collection tab and you can search using the tools on the left. Once you found your card, right click it to "wish for this card". Mikokoro, Center of the Sea: Dark Confidant is better card draw with all basic lands in your deck, but perhaps "everyone draws a card" will keep opponents from killing it. 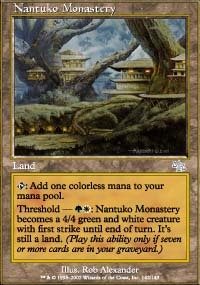 Nantuko Monastery: With you chucking lands into your graveyard every turn, hitting threshold is really easy. Why not have a 4/4 beater that can't be cleared away with creature killing sorceries? Vitu-Ghazi, the City-Tree: A better option but rarer is Kjeldoran Outpost. Pump out little 1/1s if you rather spend your available mana on them than gamble on Jhoira spells. This is almost like playing Endless Swarm, it's a little bit of a "game killer" on your side of the table. Dark Depths: This is a similar situation, but it's hard to argue with a flying indestructible 20/20 as an end result. The creatures come in larger categories of toolbox options: aggressive, card drawing, recurrance, or disruption. 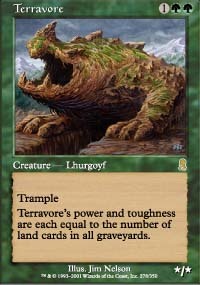 Terravore - Chances are for 1GG, you'll be able to cast this soon after wishing for it, and kill your opponent with just one attack. The mind boggles at how large this could be with Jhoira Basic. Azorius Guildmage - A possibly "no fun card" as it will shut down the only gameplay option available to your opponent. If you're out to win ("strike first strike hard no mercy sir!") then you'd want this 2 mana guy that for 2U will counter an attempted spell. Dark Confidant - Bob is a great choice for covering the aggresive and acceleration bases. For 1B, you get a 2/1 creature that draws you a free land (as your deck is all lands) each turn. Fa'adiyah Seer or Sinbad can serve as "budget bob" as a free card drawing outlet. Firemane Angel - My personal favorite. You can cast it for an aggressive creature, pitch it or have it killed to be active in the graveyard, and have a chance to return it to play with enough mana. Myr Matrix - It's nice to generate creatures at will. Even nicer that they're 2/2 and the maker is indestructible ("Thank the maker!" (who turned out to be Darth Vader BTW; he was "the maker" and "your father")). Similarly is Summoning Station. Tatsumasa, the Dragon's Fang - If you're going to spend mana, 12 for your first dragon is pretty steep, but in the format, a recurring 5/5 should win you the game. Junktroller - Reito Lantern or Feldon's Cane, for if milling is viable, so is the anti-mill. Like creatures, enchantments cover a large enough range to have various categories; creature makers, card draw, damage, and other utility enchantments. Seismic Assault - Though much harder to cast with RRR than Megrim's 2B, it could end the game immediately with a hand full of lands (and a deck only of lands), and it does not rely on the opponent to kill themselves. 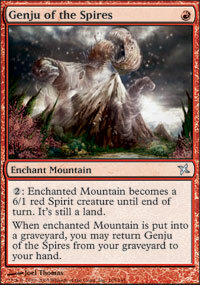 Genjus - Any of the Kamigawa Genjus are better than almost any creature making enchantment. It requires an activated cost of 2 mana, recurs itself if the land dies, and isn't a creature during your opponent's sorcery-casting turn. If there aren't any creatures on your opponent's side (chances are), you'll want the 6/1 Genju of the Spires. Hondens - Any of the Kamigawa Hondens are worthwhile, triggering on your upkeep without further mana costs. Draw a card, put a 1/1 critter into play, gain 2 life, have your opponent discard a card, or deal a point of damage. Sacred Ground - While land destruction is more prevelent in soceries, which we'll most likely be casting, this card doesn't actually help you win, just "not lose". 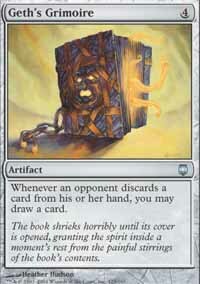 Shared Fate - If you and your opponent are playing the same deck, this would normally not impact your game, unless you have a "short stack", then you don't have to worry about decking, and if your library runs out of cards, your opponent can no longer cast spells. Instants are a little tricky to use consistantly; situational, and so chances are, by the time you pull a Cunning Wish or need to Death Wish or (Research//Development) for an instant you'll have an specific idea of what you need (and what you have, and have mana for): permanent kill, counterspell, card draw, bounce, etc. 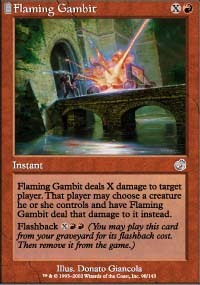 My personal favorite is Flaming Gambit, but in general, you're looking for something where the actual card is better than a Jhoira copy. For the most part the Jhoira instant or sorcery is no different from a card unless you have a useful flashback, buyback, or other recovery method. Glittering Wish should be able to get you what you need in a pinch, as with the instants, since everything you need categorically comes in a multicolored flavor (provided you have the cards). Same can be said for Death Wish and Research as far as getting any card into your hand or library. What I mean is the above ideas still apply, like Glittering Wishing for Firemane Angel or Death Wishing for a Terravore or putting 4 Gaea's Blessings or Stream of Consciousness into your library with Research. What I'm ending up now as saying is that while I started a list of nice (and admittedly often rare for their narrow or "tight" nature) is that it's really up to you, your needs at the time, your collection, and your mana. Does that mean that everything I mention is invalid to you? I hope not. I'd like to think that I got you thinking categorically in wishing for your spells and hopefully to give them thought BEFORE you pull a wish to get what you need without ruining the game for everyone while we sit and wait for the wishmaster to make his selection. Until next time, Happy Wishing (albeit quickly). Thanks for the Explination on this format!!! still don't think i will play it!!!! Rainbow Stairwell for the Win!!!! Don't forget nullstone gargoyle. If you have ramped up to 9 lands, often throught mana search its a game ender. A 4/5 flyer to beat them. Then save all of your cards to react to anytime they try to cast a second spell in their turn and actually get something. Nice article. I've been thinking about writing up something similar with my own ideas about playing Jhoira basic, but you hit most of the suggestions I would have had and quite a few more, besides. One card that was an MVP for me as a result of Glittering Wish was Mystic Enforcer. By the time I cast him, he was already at Threshold, and a 6/6 flying creature with protection from black was very hard for my opponent to deal with. It helped that he was relatively cheap to cast, too. Thanks for writing an article on this subject. I was in the position of getting a Burning Wish and not actually knowing how to wish. I figured it out eventually, but my opponent probably got annoyed with me in the meanwhile. Of course, he probably didn't know how to wish either, or he might have said something when I explained my situation. I ended up getting a Fireball with it, which I figured I could use either to finish the game, or to kill multiple tokens, depending on my needs. I think he got Fertile Imagination (and man is that card a beating in this format), so I had to go with the token-killing. So far I've played fewer than two dozen games and seen Storm Herd three times (twice for me, once for an opponent). One time I got it on turn 3. My opponent got some one-for-one removal spell, which kept him alive at one life for a turn, then got Nausea on the next turn. Of course, at that point it was only a matter of time until I pulled a burn spell. I'm curious to hear what people think about the optimal land distribution. I've been running 12/12/12/12/12, because (a) I'm lazy and (b) it ensures your domain spells will be powered up, but I saw one guy who favored Mountains and Swamps (Swamps would help Corrupt and Tendrils of Corruption, I guess), and another who played mostly or only Forests (I assume for things like Waiting in the Weeds and Beacon of Creation). All in all, I think I prefer Jhoira Basic to Momir Basic. Maybe because I prefer empty boards to creature stalls. Or maybe it's just that I've done a lot better at it. The content was good but your english is pretty poor.